Bitcoin is the currency on everyone’s lips at the moment. If you’re not involved in trading with the currency, you more than likely have an opinion on it. Whether you believe cryptocurrencies to be a thing of the future or just a fad, it’s worth getting to know more about it. One good reason to brush up on your knowledge of Bitcoins and other cryptocurrencies is because some credit card companies are beginning to ban their users from buying the currency using their cards. Over the last few weeks, Lloyds Bank and Virgin Money have stated their users will no longer be allowed to buy Bitcoin using their credit cards. 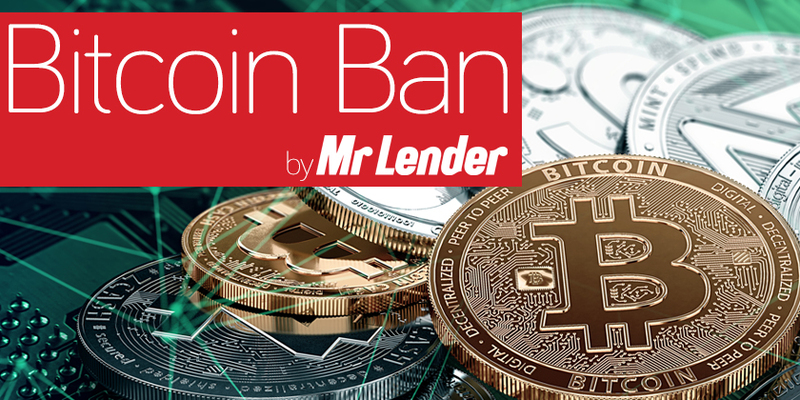 Leading short term loan provider, Mr Lender, had a look at how users will be affected and what this means for the future of cryptocurrency. The move from Lloyds Bank and Virgin Money comes as the value of Bitcoin continues to plummet at an alarming rate. Credit card companies are concerned that card holders are buying cryptocurrencies using their credit cards, and then running up a great amount of debt when the value of the coins drop. Lloyds and Virgin Money have decided to implement the ban on just their credit cards, and not their debit cards. Debit card holders will still be able to purchase cryptocurrencies if they wish. A spokesperson for Virgin Money said “following a review of our policies, I can confirm customers will no longer be able to use their Virgin Money credit card to purchase cryptocurrencies.” Many companies in America have also implemented a similar ban, preventing their card users from buying cryptocurrencies, including Bank of America, CitiGroup, JP Morgan, Capital One and Discover. Milligan notes that while the ban now means certain customers are unable to use their card to buy Bitcoin, they can still use their credit card to gamble. He says that the Bitcoin Ban shows Lloyds has decided that Bitcoin and other cryptocurrencies “represent a far bigger risk than gambling”. The value of Bitcoin peaked at around £14,465 in December 2017, before plummeting by more than half to around £5,700 in February 2018. Recent reports suggest the drop in the value of the currency came after misleading reports claimed India – one of the world’s largest traders in Bitcoin – would be implementing a ban on the currency. If a ban were to be issued in India, a large percentage of the market would be cut off and the value would inevitably plummet further. His statement was understood by many to mean the country would ban the use of cryptocurrencies as a whole because they were ‘illegal’, when in actual fact Jaitley simply meant the government would be implementing a ban on using cryptocurrencies for illegal activities. A number of countries across the world are beginning to implement bans and regulatory measures on the use of Bitcoin and other cryptocurrencies. Japan has recently held their first raid on a ‘cryptocurrency exchange’ following a string of hacks meaning some companies are now having to reimburse customers. Japan based cryptoexchange – Coincheck – promised to reimburse 523million units of XEM to 260,000 customers (around 81 cents per unit). Mount Gox is another cryptoexchange which was a victim of a hack and subsequently failed in 2014. The hack meant customers lost $500million work of Bitcoin. In December 2014, Youbit (a South Korean Bitcoin exchange) lost a quarter of its digital currency in a hack. Many governments and financial institutions are now recognising that some form of regulation is necessary for the future of Bitcoin and other cryptocurrencies around the world. However, not everyone is so open to the idea of government intervention and regulation. One of the main attractions for using cryptocurrencies is that it is decentralised – meaning it’s free from government control and currency exchanges. Whether we like it or not, and whether it’s a success or not, the cryptocurrency industry looks like it’s around to stay for the foreseeable future and will likely shape the way businesses operate in the coming years. Previous Previous post: £10 Note Deadline: How Long Do You Have to Get Rid of Your Old Notes? Next Next post: Spring Statement 2018: What Was Said and How Does It Affect You?